Public restrooms have a bad reputation. Many people consider them to be unsanitary, smelly, and full of germs. Many times they are right. Much of the blame lies with restroom patrons who do not properly wash their hands. Improper hand washing promotes the spread of infection-causing germs on high touch surfaces in restrooms like sinks, faucets, soap dispensers, and door handles. 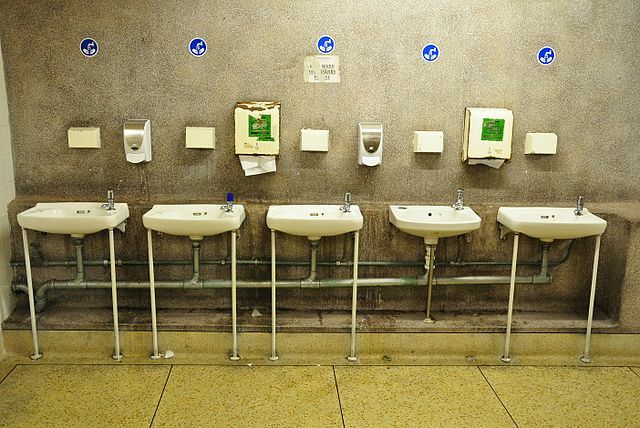 Research backs this up: a 2013 Michigan State University study discovered that a shocking 95 percent of people who visit public restrooms do not wash their hands well enough to fully kill germs. Ten percent of patrons didn’t wash their hands at all. With flu season around the corner, and with millions of Americans making travel plans for the holidays, it is more important than ever for facilities managers to keep restrooms clean to prevent the spread of germs. A truly clean restroom is one that is also disinfected. Using the proper combination of products and practices, your restrooms can look clean and reduce the spread of germs. Promote frequent and proper hand washing. Hand washing is one of the most effective, and one of the simplest, ways to stop the spread of infection-causing germs. Both patrons and employees should wash their hands after using the restroom. Improving the incidence of hand washing can be achieved with signage by sinks. Information about hand washing statistics, and step-by-step instructions make a difference. Although it may initially seem ridiculous to include hand washing instructions in a bathroom (everyone knows how to wash their hands, right? ), many people actually don’t know how long they should wash their hands to effectively kill germs. Vigorous, thorough scrubbing with a hand soap is needed on all parts of the hands for at least 20 seconds. This includes wrists, fingernails, and between fingers. Create a Comprehensive and Sustainable Cleaning Strategy. Not all of the responsibility for germ-free bathrooms rests in patrons’ hands, however. Facilities that provide restrooms need to be proactive and consistent in eliminating germs from restroom surfaces. An effective plan begins with a detailed schedule. A good cleaning schedule will outline specific cleaning tasks and frequencies. Employees will also mark when a cleaning task has been accomplished to make sure that the schedule is current. Knowledge and training of current equipment and cleaning practices will make sure that staff members are effective cleaners. A solid training program will include ongoing education of cleaning solutions, safety practices, equipment usage, and best practices. Regular inspection will help reinforce the importance of proper cleaning and will give you assurance that your facilities are properly maintained. Finally, as a step toward preventing cross-contamination, restroom cleaning equipment can be color-coded to alert staff that it is only intended for use in restrooms. On that note, equipment used on floors and toilets in restrooms should not be used to clean faucets and counter tops. A top to bottom cleaning approach will prevent this, and will help ensure that dirt and bacteria are effectively removed. Use Effective, Professional Cleaning Solutions. Doing a job right means using the right tools. The U.S. Environmental Protection Agency (EPA) recommends a list of professional-strength cleaners. It is important to select cleaning products that are both effective and sustainable. An all-purpose cleaner will both clean and disinfect, and is an ideal cleaning agent for restroom surfaces. It is important to use a product that both cleans and disinfects. Cleaning is the removal of dirt; disinfecting is the actual killing of germs. Additionally, cleaning staff need to appropriately apply the all-purpose cleaner for its benefits to be realized. Using the right proportion and allowing it to dwell on a surface for the required amount of time are both essential for the solution to perform effectively. Some dwell times can be as long as 10 minutes. Make sure your staff are aware of the dwell times of each cleaning product and adhere to them. Enforce a daily cleaning regimen. Some restrooms need to be cleaned every few hours — some are only cleaned at the beginning or end of the day. The frequency of cleaning will depend on how heavily used the restroom is. 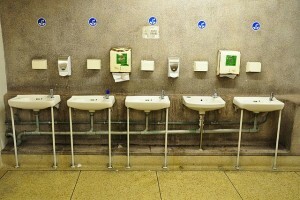 At the very least, restrooms should be deep cleaned every day. Staff should temporarily close the facility so they have enough time to allow for dwell times and thorough cleaning practices. A complete cleaning of every surface should be performed, from walls and baseboards to faucet handles, towel dispensers and toilet seats. Additionally, all supplies should be restocked to ensure patrons always have access to soap and hand drying options. Frequently focus on high-touch surfaces. In addition to scheduled daily cleaning and deep cleaning, you should require regular spot cleaning of restrooms. Quick five minute cleaning stops can keep high-touch surfaces like faucets and counter tops clean throughout the day. Most importantly, frequent cleaning of high-touch surfaces can help reduce the amount of cross-contamination between restroom patrons. A spot-clean can target door knobs, toilet seats, counter tops, light switches, dispenser levers, and handles. Spot cleaning is also a good time to remove the trash and make sure that paper towels are not strewn across the floor. Studies have documented that people avoid using unclean restrooms and may avoid proper hand washing if facilities appear unclean. These five tips will ensure clean bathrooms that help reduce the amount of infection during the upcoming holiday season. These practices will also keep your bathrooms both clean and disinfected.